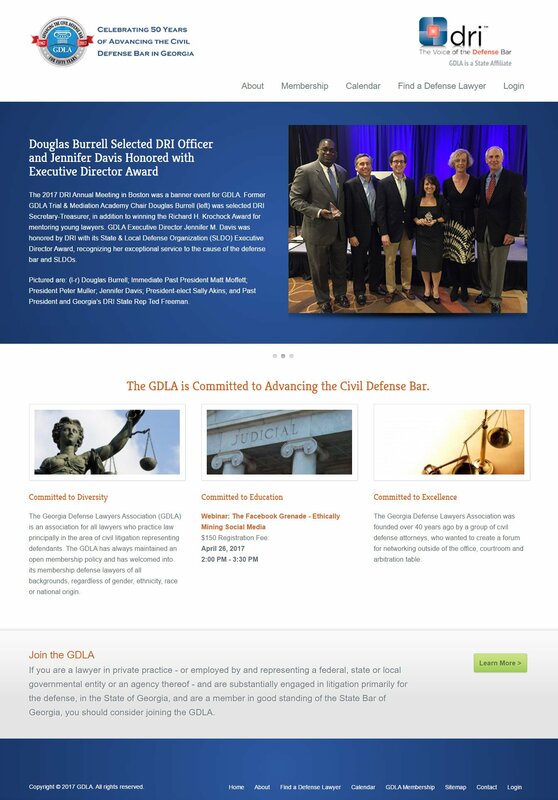 The Georgia Defense Lawyers Association is a large member organization founded over 40 years ago by a group of civil defense attorneys, who wanted to create a forum for networking outside of the office, courtroom and arbitration table that needed a custom content management system. Initially the GDLA’s focus was social camaraderie and the informal sharing of techniques and war stories. Today, it has expanded on the vision of its founders and evolved to offer formal avenues for training, networking and communication. GDLA membership benefits include CLE seminars, judicial receptions, a newsletter and annual Law Journal, plus access to an e-mail blast system that allows members to pose questions about experts, points of law, emerging issues, and more.